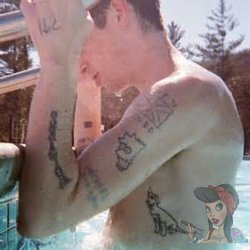 Cole Mohr is an American model from Houston, Texas, signed with Request Model Management. Notable for work with Dior Homme, H&M, Burberry, and Marc Jacobs. He is currently #13 on models.com's list of top male models. 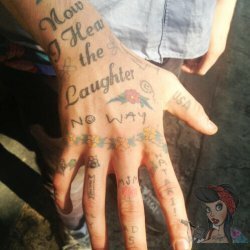 Cole has so many tattoos all over his body that only he would know exactly what each ones means.Here is the list of his tattoos. 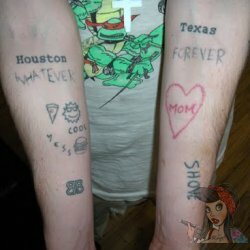 April May June (with a V above the M in may and a C underneath it)- Cole had this tattoo done because of an ex-girlfriend from Houston. Mom in a heart & Dad in a heart- this is private joke/nickname between Cole and his girlfriend, Kay. Bwack Fwag- Given to Cole by his current girlfriend, Kay. It means Black Flag, which is a punk band from the 70s. 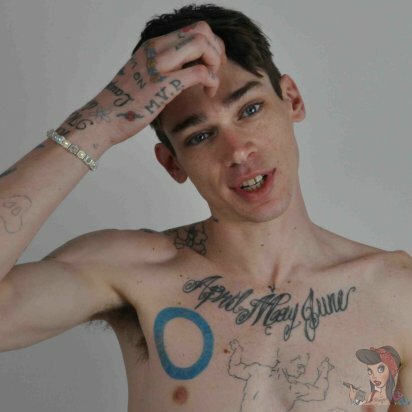 Cowabunga on his neck in cursive.Frey Mudd- Frey Mudd, a male model, gave Cole this tattoo.Cole gave Frey a tattoo that says Cole Mohr with the Texas flag. Lisa/Bart Simpson, Michael Jordan, Wolves, ?↑! LARRRYY (with something written above it)- Cole got this tattoo because of ,photographer, Lary Schwarz. Now I hear the Laughter- Taken from one of Cole’s favorite songs, Now I hear the laughter by The Germs. M J M Smiley face with tail-thing- given to Cole by Charlie Westerberg, another male model.To all my friends on his wrist.